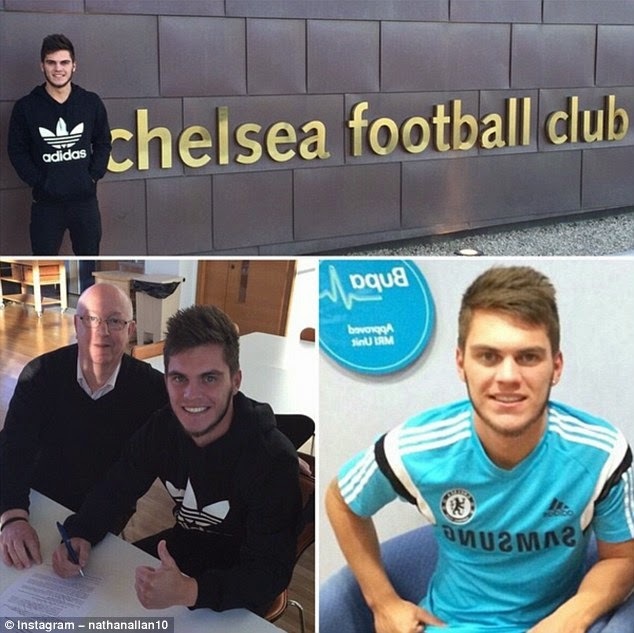 Brazilian wonderkid Nathan has taken to Instagram to confirm his arrival at Premier League champions Chelsea, and will join in a £4.5million deal. The dazzling attacking midfielder, who turned 19 in March, had been in London for talks in April and also passed a medical at Chelsea's Cobham training ground. Nathan posted a picture to his Instagram on Monday night confirming the move. The caption alongside a collage of photos reads: 'A dream is coming true! 'And I am also thankful to Club Atletico Paranaense, which was part of this journey and where I played for 6 years of my career. Nathan, who is seen as the next big thing in South American football, touches down in the capital with an ever-growing reputation, and Manchester City were also interested in his signature. Last season's Premier League champions City had hoped to tie up a deal after first spotting the player at the World Under 17 Championships two years ago. He has since broken into the Atletico Paranaense team but a serious contract dispute with the Brazilian side meant Chelsea were able to swoop. Nathan joins the already strong Brazilian contingent at Chelsea, moving alongside Willian, Ramires, Filipe Luis and Oscar. The staggering potential of Nathan, who can also play as a secondary striker, means he could feature in Jose Mourinho’s first team next season.